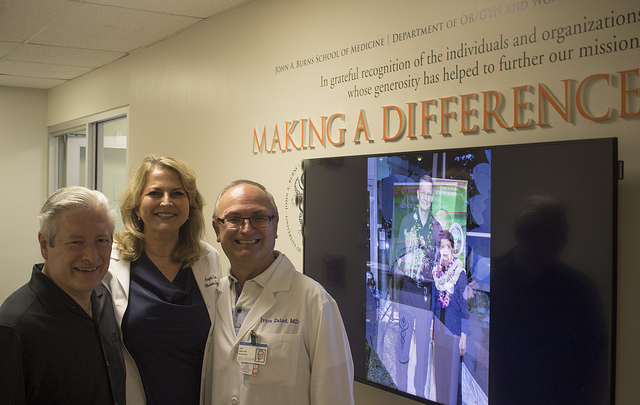 (L to R): Dean Jerris Hedges, Dr. Angela Pratt and Dr. Ivica Zalud stand next to the new donor wall. Vina Cristobal Photo. Sentimental stories were shared at the unveiling of the new donor wall at the Department of Obstetrics, Gynecology and Women’s Health (OB-GYN) in August 2018. Department chair Dr. Ivica Zalud was joined by fellow OB-GYN physicians and donors Dr. Angela Pratt, Dr. Dena Towner, and Dr. Thomas “Tom” Kosasa, as well as former Emeritus Professor Dr. Santosh Sharma; Dean Jerris Hedges; and William “Bill” McCorriston, son of the late OB-GYN doctor Dr. Colin McCorriston. Etched on the wall, in orange, read: “Making a Difference,” with a television screen displaying milestones of the Department of OB-GYN. The adjacent four panels – which incorporated four of the plants in the medical school’s Māla Lāʻau Lapaʻau (Medicinal Plant Garden) – explained the history of the John A. Burns School of Medicine (JABSOM), the department of OB-GYN, and University Health Partners of Hawaiʻi, the faculty practice of the medical school and the UH Health Sciences. Dr. Zalud then invited the group in the conference room to reflect on the donors’ investments. This is among the many innovations that the department has made in the past year. In July 2017, Dr. Kosasa awarded three Kosasa Endowed Professorships , in Gynecological Oncology (Dr. Michael Carney), in Maternal Fetal Medicine (Dr. Men-Jean Lee), and one honoring Kosasa’s late mentor Dr. Colin McCorriston, held by Dr. Keith Terada (vice chair of the Department of OB-GYN). These gifts represent $6 million that helps the Department of OB-GYN and Women’s Health focus on both education and care. In the same month, JABSOM MD 1996 Alumna Dr. Angela Pratt created the “Angela Pratt Endowment,” a contribution that would help to further faculty, student and resident training on neighbor islands and research in Native Hawaiian Women’s Health. Dr. Zalud was named Physician of the Year by the Hawaiʻi Medical Association in October 2017. The department, in partnership with the Department of Family Medicine, opened a clinic in the Pali Momi Outpatient Center in Aiea in February 2018. This September, the department expanded its practice on Hawaiʻi Island, with Dr. Emilie Stickley becoming the first female OB-GYN from the department to practice in Hilo. “You’ve clearly made a difference on how care is delivered here, but also those who are trained in the system, to take that information and go on and not only make Hawaiʻi a healthier place, but other parts of the US where they may end up practicing. But what has transformed this department has been, in large part, contributions of research, specialized educational elements that have developed, that we just couldn’t do without those funds. So thank you all for your generosity and your vision. Just know that your contributions will make a significant change,” Dean Hedges added. The doctors that have made investments into the department means more than a name on the wall. For Dr. Pratt, her act of giving was inspired by the late Dr. Colin McCorriston, who she, too, looked up to as a mentor. She recalled of a time when she witnessed Dr. McCorriston’s generosity during her years as a JABSOM student. “It shows,” Bill McCorriston responded. Dr. Zalud hopes that these investments will “inspire” not only other OB-GYN doctors to give, but that other departments will also donate and eventually develop internal giving programs of their own. “Any investment is valued, small or big,” he said.